Waste plastics are usually made of single screw extruder or twin screw extruder. We put the pieces of plastics into the extruder, and then we granulate them by plasticizing, filtering, mixing, exhausting. The granulator is made up of extrusion system, transmission system and heating&cooling system. The extrusion system consists of screw, barrel, hopper, head and die, The waste plastics are plasticized into a uniform melt through the extrusion system, and under pressure in this process, the screw is continuously extruded to the head of the machine. After the material is melted in the cylinder, the material can be extruded by filtration. The filter device is the filter or filter net. Some filter devices can guarantee the continuous production without stopping, and the filtered material flows to the extruder head to cutting granules. 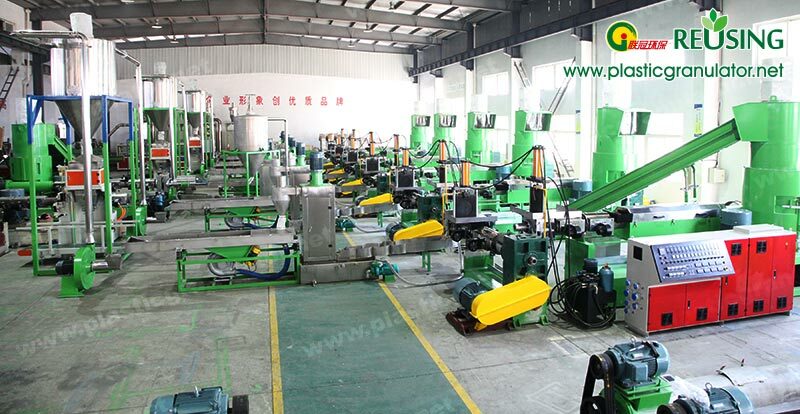 Noodle pelletizer is suitable for thermoplastic and engineering plastics, and the resulting particle shapes are generally cylindrical or waist drum，Its equipment structure is simple, low power consumption, convenient operation and maintenance, the particle does not need to be dried, Its disadvantage is that there may be adhesion between particles, and the melt flow rate should not be too fast, so the output is relatively low; The main disadvantage is that the power consumption is large and the tool wear is serious. The noise generated during equipment operation, the amount of dust and the size of odor are also the necessary conditions for waste plastic granulating machine purchase.